This unspectacular wildflower is sometimes confused with Deadly Nightshade, but at typically only 8mm across the flowers of Common Figwort are only about a third the size of those of Deadly Nightshade. The stem has a square cross-section, which also helps distinguish it from Deadly Nightshade (whose stems are round). 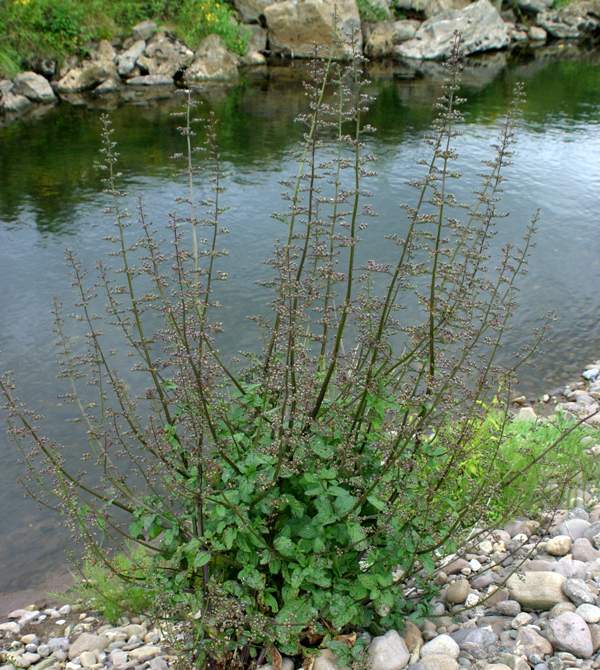 Common Figwort is found throughout Britain and Ireland except for the far north. This tall plant of shaded hedgerows and woods prefers damp soil. The first flowers appear in early June, and figworts can be found blooming as late as September in well-shaded places. In the riverside picture above, taken in early June, the dull purple flowers are just opening. The genus was named Scrophularia in the belief that figworts had the power to cure scrofula, a strain of bovine tuberculosis that was particularly prevalent in the 18th century. The specific epithet nodosa is nothing to do with nodding; it comes from Latin and refers to the presence of conspicuous nodes. 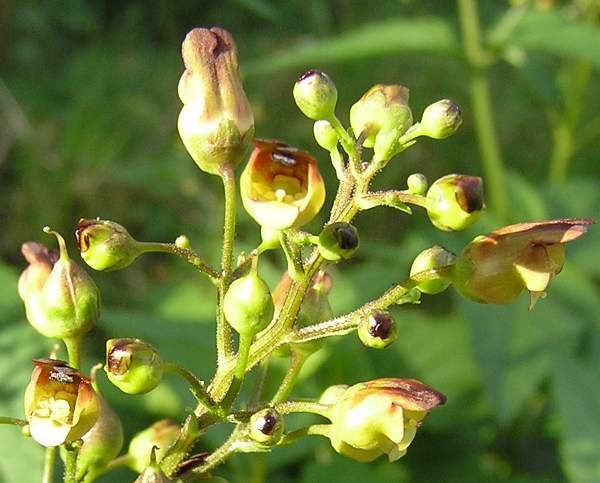 The unwinged square stems of this plant help to distinguish it from the otherwise very similar Water Figwort, Scrophularia auriculata, which has an overall redder flower. Just as it sounds, the specific epithet nodosa refers to the conspicuous nodes on the stems of this wildflower. These specimens were photographed in Wales in July.